Sept. 11-13, 2018, Monroe, LA. Please go to https://livestockvetento.tamu.edu/3-day-master-vector-certification-course/ to register. There is NO CHARGE for this program. IF you have any questions please contact Sonja L. Swiger at slswiger@ag.tamu.edu or Heidi at 254-968-4144 ext. 225. 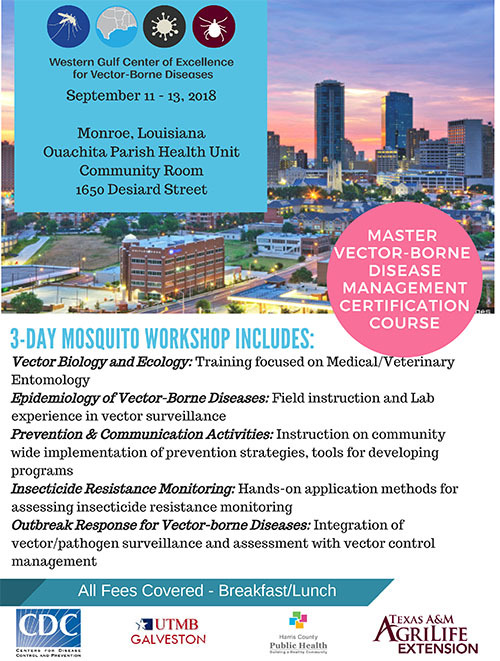 3-Day Mosquito Workshop information (PDF image).